Magic™ Mouse Adjuvant is a novel immunization adjuvant specifically designed for rapid production of high titers of antibodies in mice. It is by far the most efficient mouse adjuvant for all types of immunogens tested, in terms of its rapidness in raising immune responses and the antibody tiers it produces. 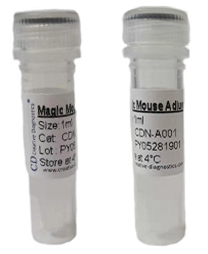 Creative Diagnostics has invented novel immunization Magic™ Adjuvants specifically designed for rapid production of high titers antibodies in mice (Magic™ Mouse Adjuvant) and human (Magic™ Human Adjuvant). Our Magic™ Mouse Adjuvant is by far the most efficient mouse adjuvant for all types of immunogens tested. Adjuvants are substances that can accelerate, prolong, or enhance antigen-specific immune responses. As crucial components of vaccines, adjuvants can improve vaccine efficacy and/or modulate immune responses types of the co-inoculated antigen. Adjuvants employ several mechanisms to modulate immune response of a specific antigen, such as formation of depot, sustained release of antigen, up-regulation of cytokines and chemokines, increase antigen uptake and presentation to antigen presenting cells (APC), as well as activation and maturation of APC. As a leading supplier of products and services in antibody development, immunoassay and diagnosis, Creative Diagnostics has over 10 years of experience in novel adjuvants development. Our Magic™ Adjuvants are highly efficient, biocompatible, convenient and economical, which have become the gold standard references for any immunization experiments. Introduction Magic™ Mouse Adjuvant is a novel immunization adjuvant specifically designed for rapid production of high titers of antibodies in mice. The adjuvant contains immune-stimulatory CpG DNA-short oligodeoxynucleotide that contain unmethylated cytosine-guanine dinucleotides. Among all research vaccine adjuvants available in the market, Magic™ Mouse Adjuvant is by far the most efficient mouse adjuvant for all types of immunogens tested, in terms of its rapidness in raising immune responses and the antibody tiers it produces. Kit Contents 1.0 mL Magic™ Mouse Adjuvant, sufficient for immunization (priming and two boosts) of up to 10 mice. Key Features • Highly effective-rapid production of high titers of antibodies. • Safe-non-toxic adjuvant with no adverse side effects to animals. • Immunogen- and adjuvant-sparing-much less immunogen required than with conventional methods. • Time-saving-strong immune responses can be reached within 35 days after immunization. • Extremely valuable-in producing antibodies against conformational epitopes. Storage & Stability Magic™ Mouse Adjuvant is supplied as a ready-to-use solution and is shipped at ambient temperature. Upon arrival, it should be stored at 2-8°C. The adjuvant is stable for up to 1 year at 2-8°C. Citations • Bernardo L, Denomme G A, Shah K, et al. RhD Specific Antibodies Are Not Detectable in HLA-DRB1 Mice Challenged with Human RhD Positive Erythrocytes[J]. Advances in hematology, 2014. • Ferreira V P, Vale V F, Pangburn M K, et al. SALO, a novel classical pathway complement inhibitor from saliva of the sand fly Lutzomyia longipalpis[J]. Scientific reports, 2016, 6. • Palomo C, Mas V, Thom M, et al. Influence of Respiratory Syncytial Virus F Glycoprotein Conformation on Induction of Protective Immune Responses[J]. Journal of virology, 2016, 90(11): 5485-5498. • Olga A B, Tavares D, Setiady J, et al. Antibodies and Assays for Detection of Folate Receptor 1: U.S. Patent Application 14/473,828[P]. 2014-8-29. • Mendes-Sousa, Antonio F., et al. "The sand Fly salivary Protein lufaxin inhibits the early steps of the alternative Pathway of complement by Direct Binding to the Proconvertase c3b-B." Frontiers in immunology 8 (2017): 1065. • Asojo, Oluwatoyin A., et al. "Structure of SALO, a leishmaniasis vaccine candidate from the sand fly Lutzomyia longipalpis." PLoS neglected tropical diseases 11.3 (2017): e0005374. Introduction Magic™ Human Adjuvant is a novel immunization adjuvant specifically designed for efficient promotion of immune response in humans. The adjuvant is based on a newly discovered immune-stimulatory oligodeoxynucleotide (CpG ODN)—a short oligonucleotide that contains unmethylated CpG-motif within a unique DNA base context, which is extremely effective in humans. CpG motifs are pathogen-associated molecular patterns (PAMPs) and recognized by the toll-like receptor 9 (TLR9), which is constitutively expressed only in B cells and plasmacytoid dendritic cells (pDCs) in humans and other higher primates. Exposure to CpG ODN results in very rapid and strong immune activation, and, when applied with an antigen, CpG ODN produces high titers of antigen-specific antibodies. The strong immune-stimulatory properties of the CpG ODN sequence contained in Magic™ Human Adjuvant make it ideal as a vaccine adjuvant. Therefore, our discovery of such a CpG ODN sequence effective for human immune system is of great significance in various immunologic fields, such as vaccine development, tumor immune-therapy, infection prevention and allergy treatment. 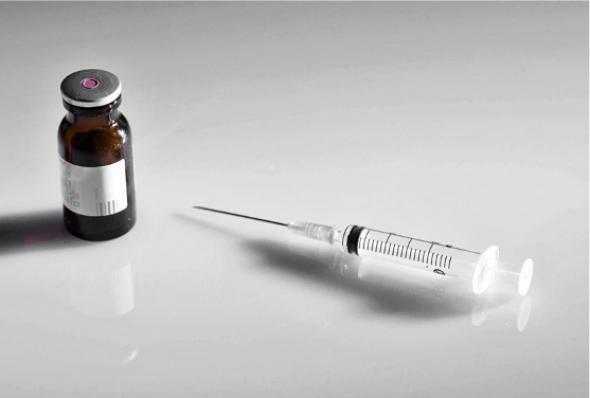 Three main types of vaccine are generally employed: i) live-attenuated vaccines, ii) inactivated vaccines that are heat- or chemically- killed microorganisms and iii) sub-unit vaccines that are made from components of the pathogen such as proteins, peptides or genetic materials. Immunization or vaccines induce pathogen-specific adaptive immunity by generating memory cells against a specific pathogen. Successful vaccines for certain pathogens will likely require enhanced immune responses including Th1-cellular-mediated immunity or a more robust Th2-humoral response. For antibody production, a strong Th2 response will be preferred. The quality of the vaccine-induced immune response or level of antibody production will depend on several factors including, the route, number and timing of administrations, the nature of the antigen and the quality of antigen presentation. This whole process is facilitated by the adjuvants. Indeed, adjuvants allow overcoming the poorly immunogenic properties of most protein, peptide and DNA vaccines (lacking natural immune triggers) or the induction of inappropriate immune responses. Thus adjuvants can be used to: i) enhance the immune response, ii) orient the immune response through modulation of the Th1/Th2 balance and iii) reduce the amount of antigen needed and the number of injections required to induce protection (antigen-dose sparing).